Iams Puppy and Junior diets are a range of nutritionally balanced foods for active and growing dogs. The diets cater to the specific needs and preferences of small and medium breeds and contain digestible, delicious ingredients to appeal to even the fussiest appetites, ensuring all the essential goodness needed for growth and development is provided. The formulas also combine a beneficial blend of vitamins for immune support, as well as adapted levels of calcium for healthy skeletal development, cognitive support and efficient digestion and nutrient absorption. With the highest quality, fresh meats for advanced flavour and palatability. Dried Chicken and Turkey: 32% (chicken: 19%), maize, wheat, animal fat, dried beet pulp (2.9%), sorghum, hydrolysed animal proteins, fish oil, dried whole egg, brewer's dried yeast, potassium chloride, sodium chloride, fructooligosaccharides (0.14%). Vitamins: Vitamin A: 41844IU/kg, Vitamin Dâ: 1731IU/kg, Vitamin E: 128mg/kg. Trace elements: Ferrous sulphate monohydrate: 723mg/kg, Zinc oxide: 251mg/kg, manganous oxide: 39mg/kg, Manganous sulphate monohydrate: 55mg/kg,Cupric sulphate pentahydrate: 54mg/kg, Potassium iodide: 3.9mg/kg. These guideline amounts are a starting point and your puppy may need more food depending upon age, activity and temperament. In order to reach optimal body condition, you may need to adjust food intake. This represents the total recommended volume of food per day. You should divide the total recommended feeding amount by the number of times you feed your puppy per day to get the actual portion size per feeding. Remember to have clean, fresh water available for your puppy at all times. This formula is recommended for pregnant and nursing dogs. During the last three weeks of gestation, increase feeding amounts by 25 to 50%. During lactation, feed as much as she wants (usually two to five times the guideline amount, depending on litter size). When introducing Iams Puppy food, gradually mix it with your puppy's current food over the course of 4 days. 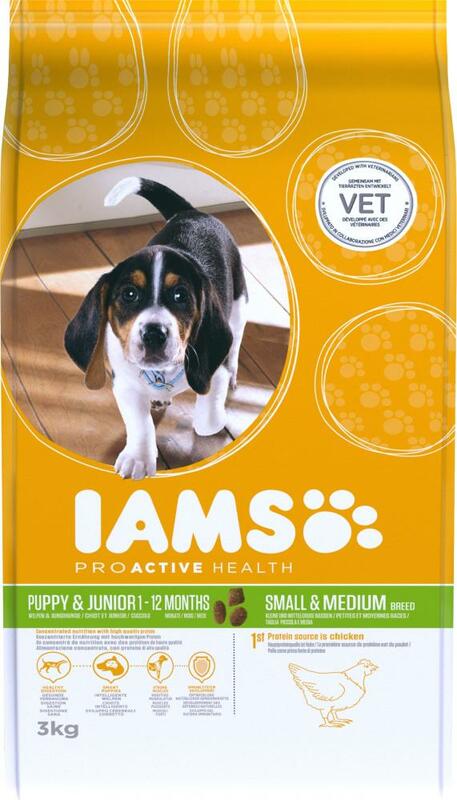 There are currently no questions for Iams ProActive Health Puppy & Junior Small/Medium Breed Dog Food - be the first to ask one!